Levine Music is proud to partner with Howard University’s Premier Vocal Ensemble, Afro Blue, to kick off JazzFest. Performing music similar to the styles of Lambert, Hendricks and Ross, The Manhattan Transfer and Take 6 while adding their own unique sound, this “vocal big band” has performed to wide critical acclaim. 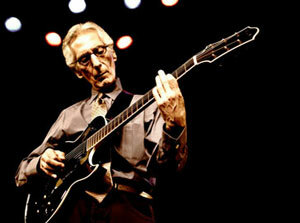 Guitarist Pat Martino is one of the most important figures in modern jazz guitar. Playing professionally since 1961, Mr. Martino has performed and toured with a wide variety of artists. He has embarked a remarkable journey with the guitar including recovering from a total memory loss only to come back to the top of the field. He is currently a recording artist with Blue Note Records and serves on the faculty at the University of the Arts in Philadelphia. Join us for a masterclass in which Mr. Martino will explore the nature of the guitar and work with students to share new approaches to better understand the unique challenges of the instrument.